40GBASE-SR4 QSFP+ transceivers is now being widely used for 40G network interconnection in short distance. This is a highly integrated component which has small size and uses four channels to support conversions between optical signals and electrical signals over a high data rate up to 40G. However, another component which can replace this transceiver in network interconnection becomes popular in data center application. It is 40GBASE QSFP+ AOC (active optical cable). AOC is a kind of direct attached cable (DAC), which is available in 10G, 40G and even 120G. 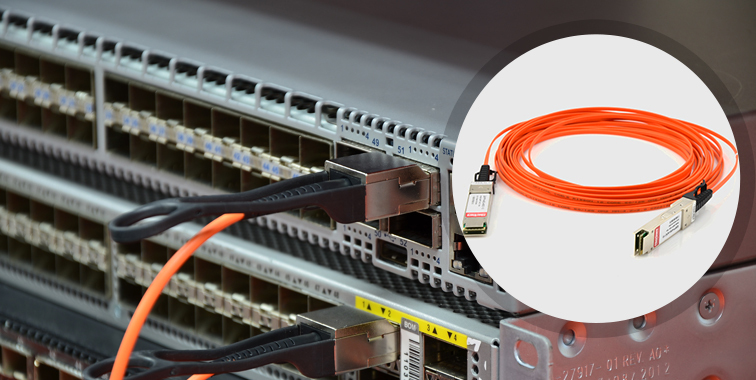 40GBASE QSFP+ AOC contains a QSFP+ connector on one end and one QSFP+ connector on the other end which are linked by a length of fiber optic cable. There are also fanout versions of 40GBASE QSFP+ AOC with one end connected with a QSFP+ connector and the other end with several SFP+/XFP connectors. It looks like a fiber optic patch cable, but, it has a similar function of optical transceiver, and also can transmission signals with its fiber optic cable. 40G AOC removes the process of two modules, which must be done in a 40G interconnection using 40G SR4 QSFP+ transceiver. It seems that both 40G AOC and 40G transceiver are good solutions for interconnection. However, everything has it’s Pros and Cons. Figure out the one that fits your application is the most reasonable way. The following is to offer comparison between these two components for your references. Transmission Distance: The first aspect to be considered is the transmission distance of these two components. Currently the 40G transmission is usually used in backbone network. Thus, to assure the transmission quality, distance should be ensured. Both 40GBASE-SR4 QSFP+ and 40GBASE QSFP+ AOC are designed for 40G transmission in short distance. Generally, when the distance is shorter than 100 meters, the two have similar performance. However, when it’s longer than 100 meters, AOC cannot perform as good as transceiver. Currently most 40G AOC provided by the manufacturers are less than 100 meters. However, Fiberstore can provide 40G AOC up to 300 meters. Reliability: In work state, both of the components should be inserted into a switch or server. And the repeating plug of them are necessary for daily use and maintenance. It is known to us that, these actions might affect the performances of the component. Thus reliability of these components should be considered. The connectors of 40G AOC are factory pre-terminated, while QSFP+ SR4 transceivers are connected by additional MPO connectors and fiber optic cable. Thus, compared with QSFP+ SR4 transceiver, AOC is less affected by the repeating plug during daily use. It has been proved that AOC has better reliability than that of transceivers. Installation and Maintenance: it has been clear that 40G AOC is much easier during installation, as the connectors have already terminated in factory. Customers just need to plug the two connectors in the switches, then can start working. While, for 40G SR4 QSFP+, additional patch cords with MPO connectors are used to finish the link. If there is a fault in the interconnection, for AOC, you can just replace it with another AOC. 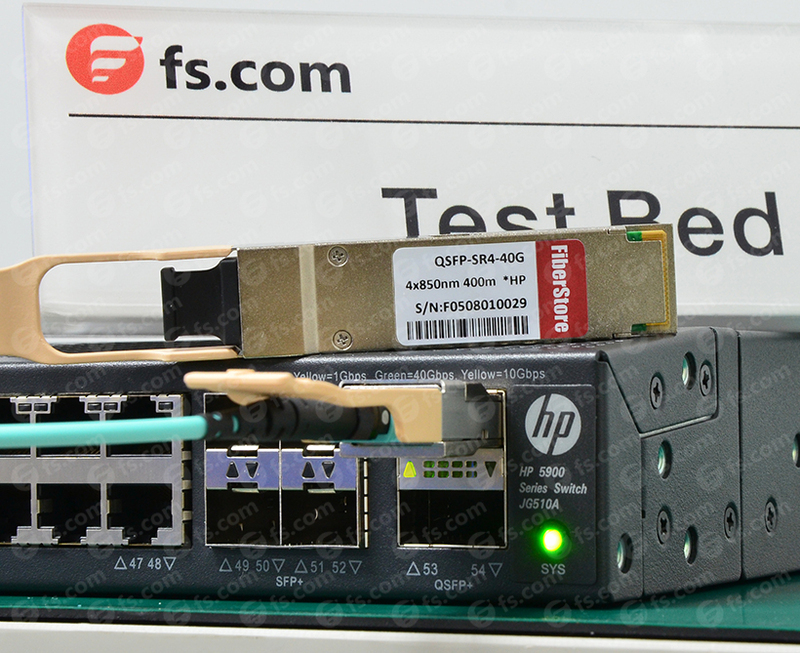 However, for interconnection using 40G QSFP+ SR4 transceivers, you have to locate the fault firstly by testing the patch cords and optics. Digital Diagnostic Monitoring (DDM): to achieve the best working state, most modern transceivers are armed with DDM function. With it, the working states and performance of the optics can be visually controlled. No wonder that 40GBASE-SR4 QSFP+ has such function. However, 40G AOCs that are provided by the market now do not have it. Cost: two main aspects should be considered in selection a product in data center. One is the material cost. The other is the maintenance cost in the daily use. AOC has advantages over transceivers on both aspects. The price for 40G AOC is generally cheaper than 40G QSFP+ SR4. In addition, the interconnections reply on 40G transceivers also need additional fiber optic cables. The latter aspect has been clearly illustrated in the above. AOC can save more in general. In conclusion, 40GBASE-SR4 QSFP+ can achieve best working status by using DDM and it has better performance when the transmission distance is longer than 100 meters. While 40GBASE QSFP+ AOC is cheaper, easy to manage and test, and it has similar performance as the former does over transmission distance less than 100 meters. For your reference, Fiberstore offer a wide range of both 40GBASE-SR4 QSFP+ and 40GBASE QSFP+ AOC. You can trust all of them cause they are all be tested before they go to the marker. Kindly contact sale@fs.com or visit FS.COM for more detail, if you are interested. This entry was posted in Active Optical Cable, Direct Attach Cable, Fiber Cabling, Optical Transceiver Solution and tagged 40G AOC, 40G QSFP+, 40G QSFP+ AOC, 40GBASE-SR4, AOC on February 20, 2016 by Alice Gui.